Brent and Valorie Fadler with their two sons, Parker and Matthew, started their chestnut farm in 2005. Located in beautiful Chariton County, Missouri our chestnuts are large, sweet, and delicious. 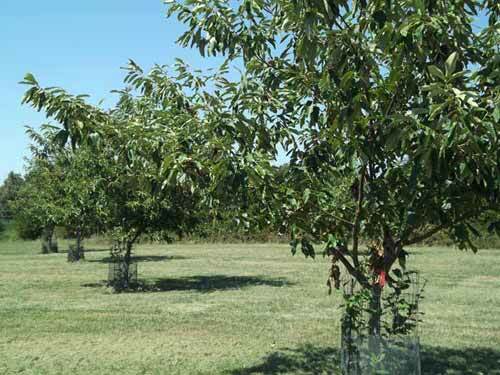 The Fadler's have used the expertise of the University of Missouri - Agroforestry Department to apply the latest and most environmentally friendly practices in growing their Chinese chestnut orchard. The chestnuts are gathered and sorted by hand so they look as beautiful as they taste. Our chestnuts have been selected to make Schlafly Chestnut Beer, prepared in upscale fine dining establishments to make delectable meals, and have been sold in local grocery stores. Our internet sales can make your family traditions and your holidays extra special knowing that they are fresh from our farm to your front door.